Meadowsweet Cottage at Swardeston Cottages in Swardeston, near Mulbarton, Norfolk sleeps 8 people. 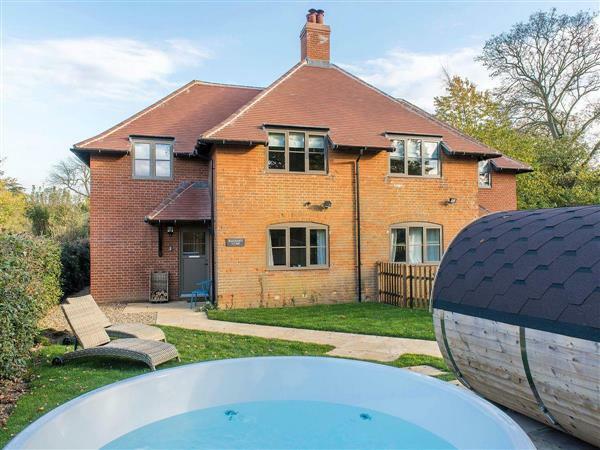 Swardeston Cottages near Mulbarton was created to provide a relaxing and stylish environment, with each cottage having its own hot tub and sauna (leisure towels are also provided); this is a perfect holiday location for family celebrations or a get together, whatever the season. The southern aspects of both cottages look over a valley with no habitation in sight, and the night sky is incredible when clear. There are excellent walks and circular routes from the doorstep, free from cars, for both walkers and cyclists. Cowslip Cottage (ref UKC2457 [Cowslip Cottage]) and Meadowsweet Cottage (ref UKC2458) are semi-detached properties and are hidden away, yet situated in the pretty village of Swardeston, a short 5-mile drive from the excellent city of Norwich. Swardeston is the birth place of Edith Cavell, probably the most famous woman to be killed during World War I and remembered around the world for all her tireless and selfless work she undertook whilst working as a nurse, before being executed on 12 October 1915. Edith’s portrait hangs in her memory on the east stained glass window of St Mary’s church and is worthy of a visit. Enjoy fresh bread, pastries and cakes from the village bakery, or visit the local pub, under 1 mile away, which serves good food. There is also a farm shop for fresh veg and fruit as well as a newsagents and butchers. Swardeston Common is very popular with walkers, also from here you can watch the local cricket matches played in front of the pavilion. Visit the fabulous north Norfolk coastline with its pretty coastal villages and glorious beaches, and explore the famous Norfolk Broads. Wroxham, 16 miles away is known as the capital of the Norfolk Broads, where you will find daily boat hire, river trips, waterside restaurants, cafés and shops. Enjoy a great day out with the children at BeWILDerwood at Horning, a treetop adventure park, Dinosaur Park at Lenwade and Pensthorpe Nature Park. Explore the Suffolk Heritage Coast and the popular seaside towns of Aldebugh and Southwold. The historical city of Norwich is 5 miles, with its cathedrals, museums, theatre, excellent shopping and cosmopolitan cafés. The seaside village of Winterton-on-Sea has an excellent sandy beach backed by dunes and plenty of shops and restaurants. Thetford Forest is ideal for tree top adventures at Go Ape, designated circular walks and cycle trails graded for different abilities. There are golf courses at Dunston Hall 2¼ miles and Barnham Broom 14 miles and a family golf course at Easton 9½ miles. The beach is 25 miles from Swardeston Cottages near Mulbarton. With the shop, pub and restaurant 1 mile from Swardeston Cottages. These properties can be booked together to sleep up to 16 people. Both properties: Oil central heating, electricity, bed linen, towels and Wi-Fi included. Initial logs for wood burner included. Travel cot and highchair available on request. Welcome pack. Enclosed lawned garden with patio and garden furniture. Hot tub for 6 (private). Sauna (private). Bike store (shared with other property on-site). Private parking for 3 cars. No smoking. Holidays at Meadowsweet Cottage, Swardeston Cottages run from Friday to Friday. Pets allowed at Swardeston Cottages - Meadowsweet Cottage. For a better idea of where Swardeston Cottages - Meadowsweet Cottage is, you can see Swardeston Cottages - Meadowsweet Cottage on the map below. Swardeston Cottages - Meadowsweet Cottage is in Norfolk; should you be on the lookout for a special offer, you can find all the special offers in Norfolk. It's always worth checking to see what is on offer at the moment. Do you want to holiday near Swardeston Cottages - Meadowsweet Cottage (UKC2458), you can see other cottages within 25 miles of Swardeston Cottages - Meadowsweet Cottage; have a look to find your perfect holiday location.